If you’ve ever rushed through the grocery store and grabbed a bundle of cilantro when you were really after parsley (or vice versa), you’ve probably found out the hard way: Cilantro and parsley are definitely not the same. And if you’ve ever accidentally served cilantro to a parsley fan, you might have gotten an earful about it (including the s-word: soapy). People get heated about these leafy green herbs. But confusing the two is an honest mistake—and a common one, at that. After all, when you’re zooming through the produce section, the two look almost identical. And, hey, they do have a few similarities beyond their looks. But there are differences between parsley and cilantro when it comes to their health benefits, how they’re used, and most of all, their flavors. Cilantro vs. parsley—what’s the difference? 1. Parsley has a milder flavor, while cilantro is bolder. Between the two, parsley is the tamer of the herbs. “Parsley has a mild flavor complex with a slightly peppery, spicy, yet very fresh and bright flavor,” says Nashville-based dietitian Jenny Beth Kroplin, RD, LDN. Some people also get a lemon vibe from parsley. On the other hand, “cilantro imparts an earthy flavor, similar to a blend of lemon and sage,” says Patricia Bannan, MS, RDN, a Los Angeles-based nutritionist and healthy eating expert. But while it does have some similar tasting notes to parsley, cilantro’s flavor is much stronger. 2. Some people also get a soapy taste from cilantro. It comes down to more than just a bolder taste, though. You might’ve heard some people complain that cilantro tastes like soap to them (or, maybe you even get that flavor)—there’s a scientific explanation for that. So, if you just can’t get over the taste of cilantro, it’s a step above picky eating (so don’t feel bad). But all hope’s not lost: According to Bannan, crushing cilantro leaves before eating them can help reduce the soapy taste. 3. They’re used in different kinds of recipes. Considering their different flavor profiles, cilantro and parsley are generally found in different kinds of cuisine. Parsley is often used in Mediterranean and Italian dishes (although it’s pretty common across the board), and it’s a mainstay in pastas, soups and stews, salads, and green smoothies and juices. Cilantro is commonly found in Mexican and Asian food (it’s sometimes called Chinese parsley), so it can be expected in salsas, on tacos, or sprinkled on curries or pho. They’re also used in different ways in recipes. Parsley’s generally incorporated during the cooking process, while cilantro is added toward the end (if it’s even cooked at all) to keep the flavor intact, says Bannan. Both leafy green herbs are often used as garnishes, too. 4. Both are great for heart and bone health, and can help control blood sugar. 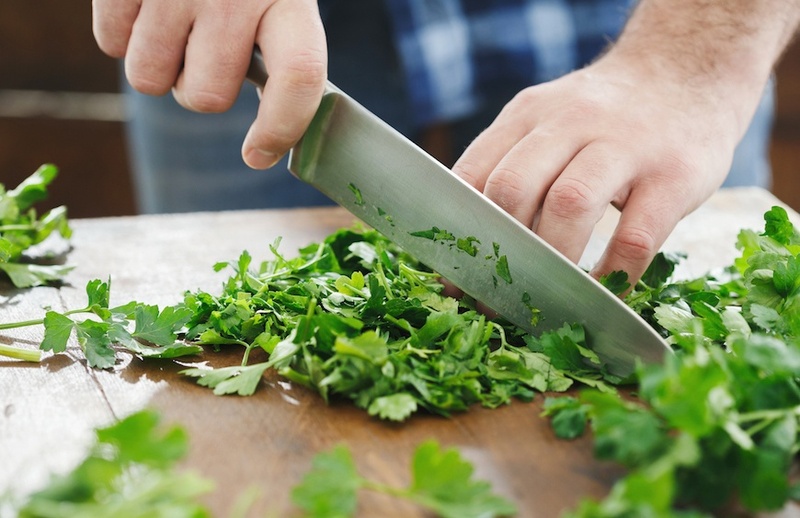 Cilantro and parsley are used for more than just flavor—both have some similar health benefits that make ’em worth adding to your meals for more than just their taste. For one, cilantro and parsley are good sources of vitamin A and vitamin C. “Vitamin A helps support eye and bone health, and both vitamin A and vitamin C are powerful antioxidants,” says Bannan. Vitamin C is great for immunity, too. They also both have high levels of vitamin K, which aids in bone health and wound healing. When it comes to blood sugar, parsley and cilantro are both known for helping keep a healthy balance. Parsley contains a flavonoid called myricetin, a powerful antioxidant with anti-inflammatory properties that’s been shown to lower blood sugar levels and decrease insulin resistance, says Kroplin. Cilantro, on the other hand, is thought to increase the enzyme activity that helps process sugar in the blood, leading to a similar blood sugar-reducing effect. They’re also both heart-healthy herbs. “Cilantro has been shown to help lower cholesterol and total triglycerides in the body, and parsley contains good levels of folate, a heart-healthy B vitamin,” says Kroplin. 5. They also have some unique health benefits of their own. While some of their health benefits overlap, cilantro and parsley both have some individual upsides. Cilantro contains a flavonoid called quercetin, says Kroplin, which fights inflammation and oxidative stress. It also has a skin-soothing effect (inside and outside the body), thanks to its natural antihistamine properties. “Cilantro is also very detoxifying and can actually help rid the body of heavy metals, plus it has an antibacterial effect, providing food poisoning protection in the body,” adds Kroplin. Parsley, on the other hand, can help ease bloating and aid in digestion, according to Kroplin. And it contains 5 percent of your daily iron per serving (which is a great benefit if you’re not big on red meat). “Iron’s an important mineral for immunity, and can also help prevent fatigue and improve concentration,” says Bannan. So, what’s better: Cilantro or parsley? They’re both great in their own ways. No matter which one you’re using, “herbs are such a great way to add flavor naturally without adding sodium or preservatives to foods and can boost nutritional benefits in our diet,” says Kroplin. If cilantro’s not your thing, though, you can still swap it out with other herbs—even parsley. Depending on your recipe, you can also replace it with equal parts of dill or Thai basil, Kroplin adds. No matter which herbs you go for, some pro tips for choosing and storing either: “The best way to keep herbs like cilantro and parsley fresh is to slightly trim the bottom stems and place them like a bouquet of flowers in a mason jar with a little water, just enough to cover ends of stems and keep in the fridge,” says Kroplin. “Change the water every couple of days, and cover the herbs loosely with a plastic bag to maintain moisture and prevent browning,” adds Bannan. And before using, wash them and dry them on a paper towel (or you can even use a salad spinner). When you’re buying them in the first place, look for herbs that aren’t wilted and discolored, says Bannan. And if you’re hunting for parsley for pasta sauce or cilantro for taco Tuesday—well, just make sure you’re snagging the right one. Another head-to-head leafy green battle: Which is better for you, kale or spinach? And here’s a veggie that’s always the right choice: pumpkin (yes, year-round).